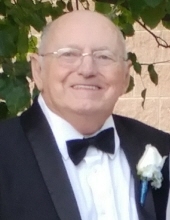 Victor H. Verrier, 75, of Tivoli, died on Thursday, November 29, 2018, at Northern Dutchess Hospital at Rhinebeck, New York. Born on May 22, 1943 in Pawtucket, RI, he was the son of Henry Verrier and Margaret Violette Verrier. On December 8, 1991, he married Barbara Watson. Victor proudly served in the United States Navy from 1962 to 1966. He retired from IBM as an electrical engineer then worked for Conklin Corp., Pleasant Valley, NY, for many years. Victor is survived by his wife, Barbara Verrier, Tivoli, daughter, Stacey R. Kirk, Virginia Beach, VA, son and daughter-in-law, Jason R. and Lisa Verrier, Poughkeepsie, NY, two stepsons and their wives, Fred W. and Andrea Schwark, NY, NY; and Michael and Kristy Schwark, Danbury, CT. He has 6 beloved grandchildren. In addition to his parents he was predeceased by two sisters, Jeannine Harrop and Henriette Tremblay. A Memorial Mass will be celebrated on Saturday, December 15, 2018, at 10 am at Our Lady of the Rosary Chapel of St. Peter’s Parish, 299 Hudson View Drive, Poughkeepsie, NY 12601. Military honors will follow the Memorial Mass. Cremation already took place at Poughkeepsie Rural Cemetery. To plant a tree in memory of Victor Verrier, please visit our Tribute Store. "Email Address" would like to share the life celebration of Victor Verrier. Click on the "link" to go to share a favorite memory or leave a condolence message for the family.